If you have a lot to communicate, simplicity always works. Mzansi was an inter-bank initiative, between South Africa’s four major banks (including the Post Office) aimed at making banking accessible and affordable to the then 6million plus un-banked South Africans. 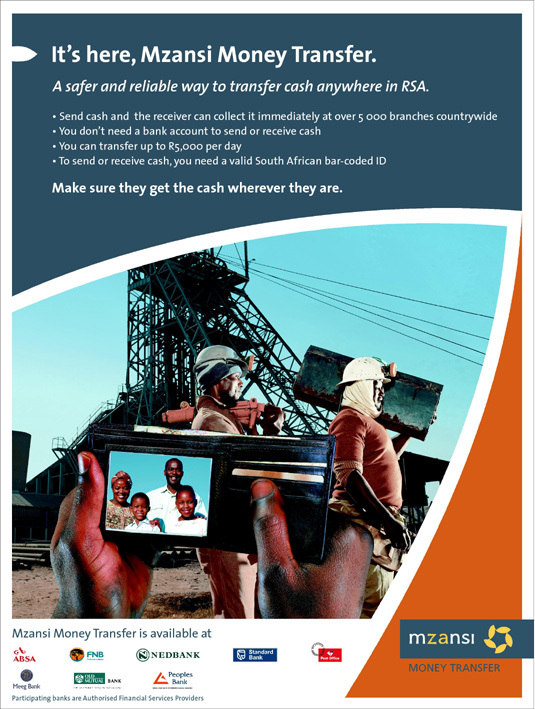 Mzansi Money Transfer was launched following the success of the Mzansi Account into the same unbanked sector of the market. It introduced and formalized the transfer of money between individuals, without a need for a bank account. It further addressed the need to send money on a regular, safe and real-time basis between two people or sources “The Sender” (originator) and the “The Receiver” (beneficiary). The Campaign’s primary and key objective was to create awareness and educate on the functions and benefits of the product or service. Agency developed and implemented a 360 degree integrated marketing campaign to reach multiple audiences in all of South Africa. The campaign sought to demystify money transfer (a potentially technical offering), showing how simple and safe it was to use. This idea of simplicity permeated and informed the entire campaign creation, execution and deployment thus effectively reaching and enticing a largely illiterate market to take up and utilise the service or product.